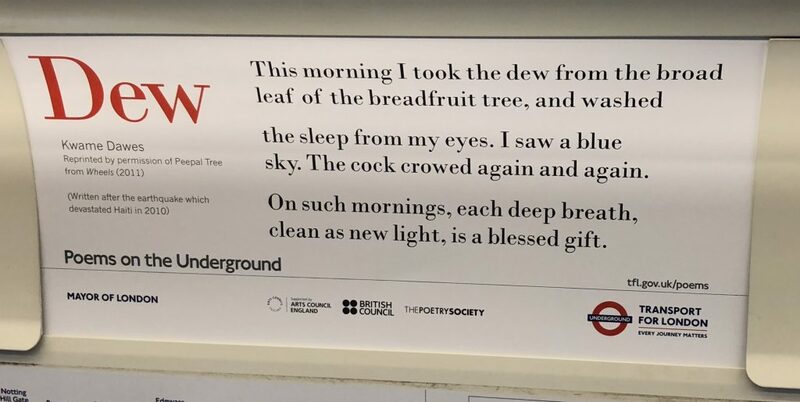 Seen on the District Line, London, on Tuesday July 10th.“Dew” by Kwame Dawes. This entry was posted in Poems, prose & song and tagged Dew poem, Kwame Dawes, poems on the subway, Poems on the underground, poetry in motion on July 13, 2018 by Louise. Seen on the 6 train, Manhattan, NYC. June 2, 2018. 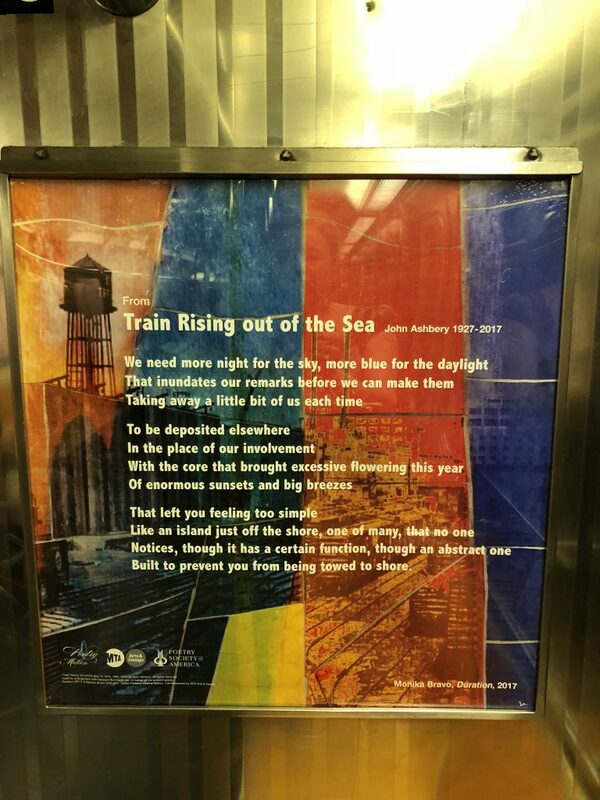 This entry was posted in Poems, prose & song and tagged John Ashbery poem, poems on the subway, poetry in motion, Train Rising out of the Sea on June 3, 2018 by Louise. Seen on the C train in Manhattan, 10 January 2018. 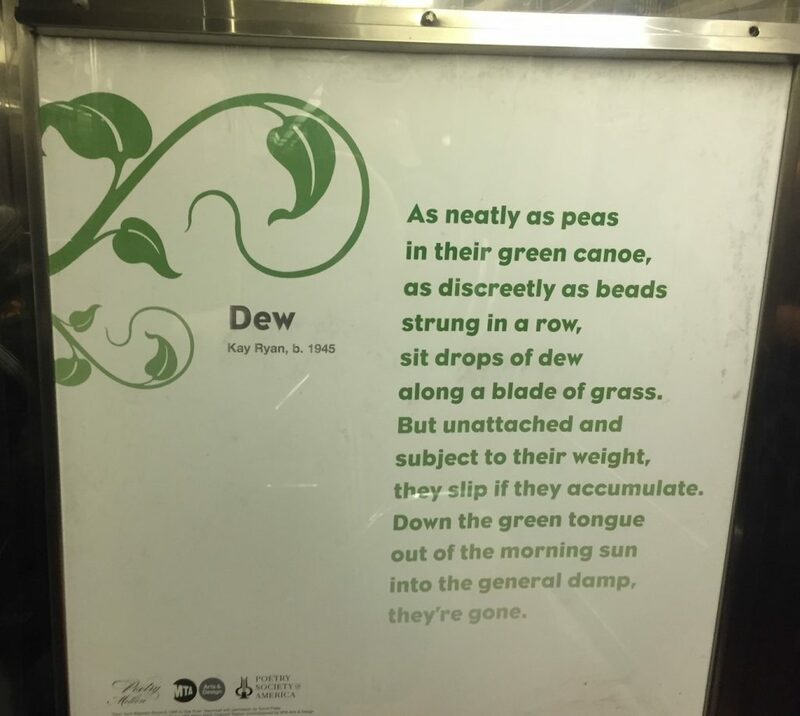 This entry was posted in Poems, prose & song and tagged Dew Kay Ryan, Dew poem, poems on the subway, poetry in motion on January 11, 2018 by Louise. Seen on the B train in Manhattan, January 9, 2018. 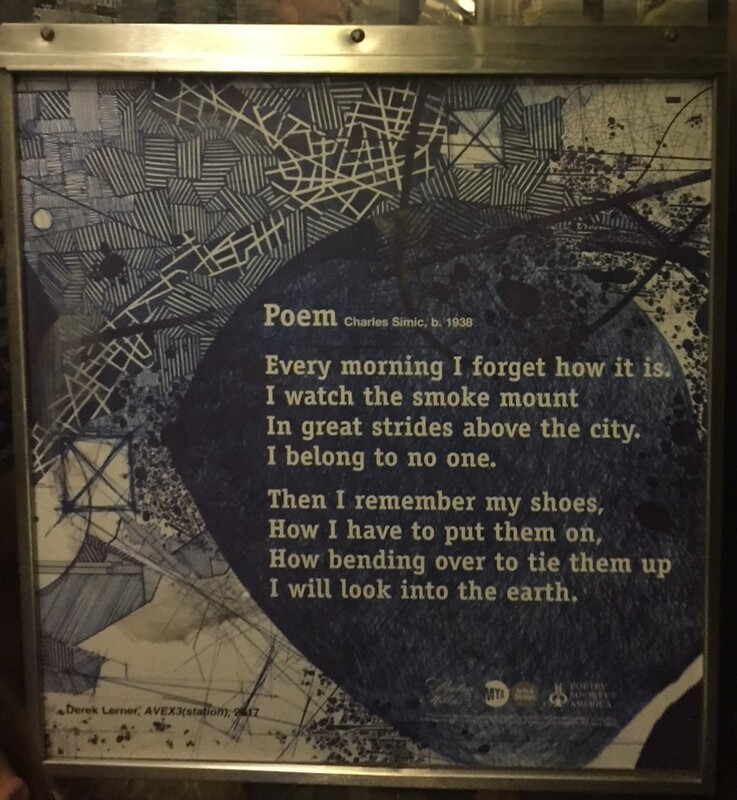 This entry was posted in Poems, prose & song and tagged Charles Simic Poem, poems on the subway, poetry in motion on January 11, 2018 by Louise. Seen on the C train in Manhattan, Sep 1, 2017. “Hide-and-Seek 1933” by Galway Kinnell. 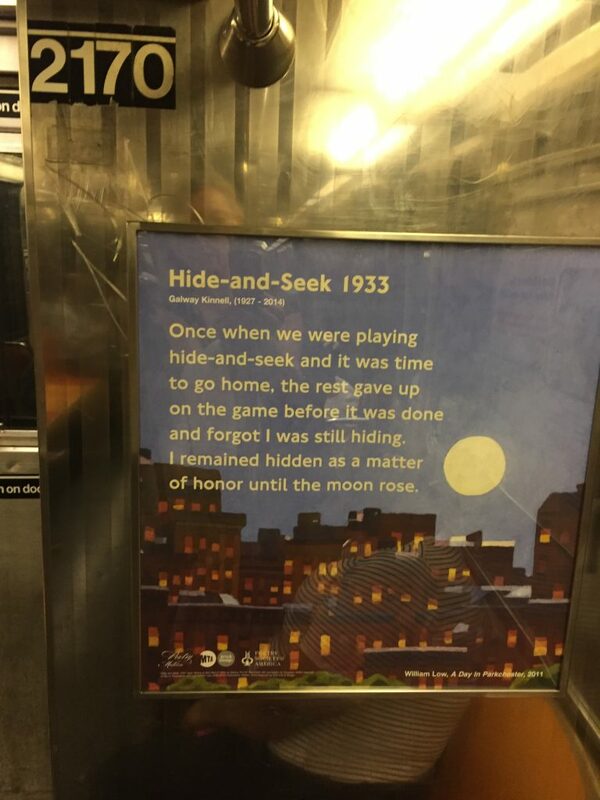 This entry was posted in Poems, prose & song and tagged Galway Kinnell poem, Hide-and-Seek 1933, poems on the subway on October 2, 2017 by Louise. Seen on the C train in Manhattan, Aug 31, 2017. “Leave It All Up to Me” by Major Jackson. 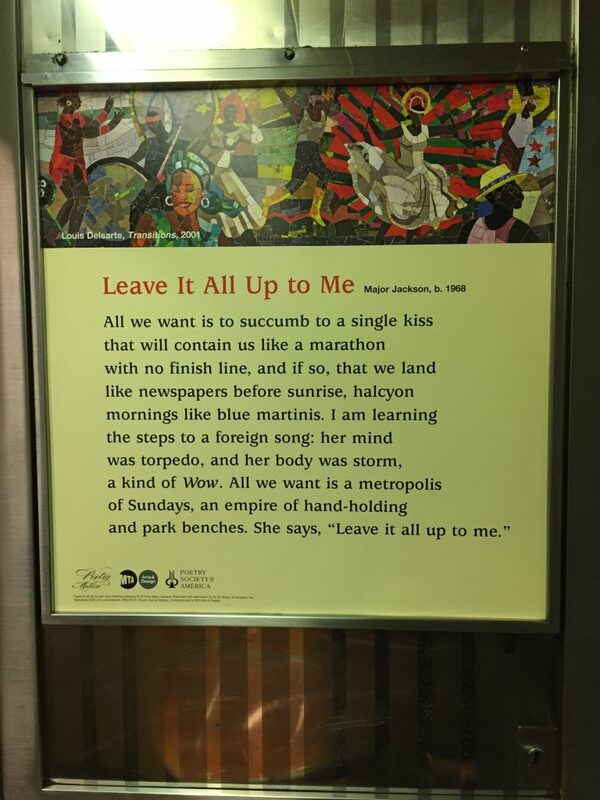 This entry was posted in Poems, prose & song and tagged Leave It All Up to Me poem, Louis Delsarte, Major Jackson poem, poems on the subway on September 30, 2017 by Louise. Seen on the 1 train, Manhattan, 1 April 2017. 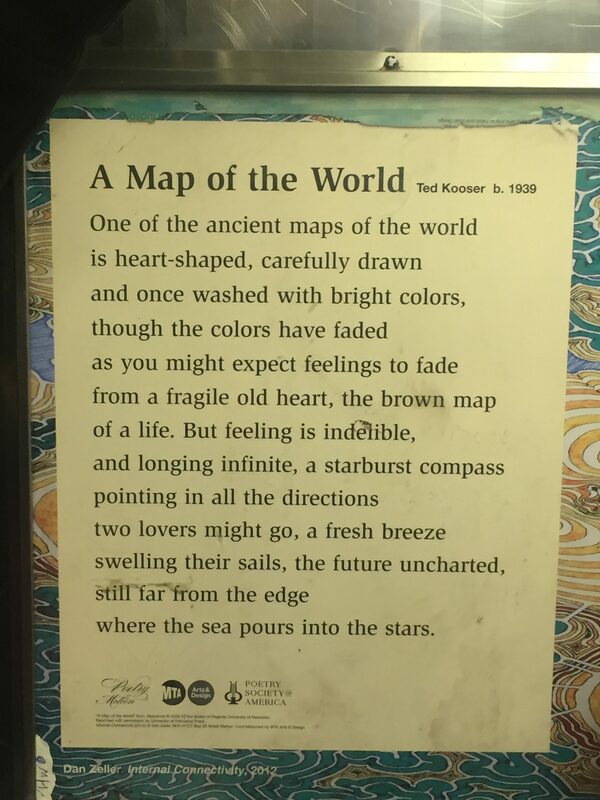 This entry was posted in Poems, prose & song, Top posts and tagged Map of the World poem, poems on the subway, poetry in motion, poetry on the subway, Ted Kooser poem on April 1, 2017 by Louise. 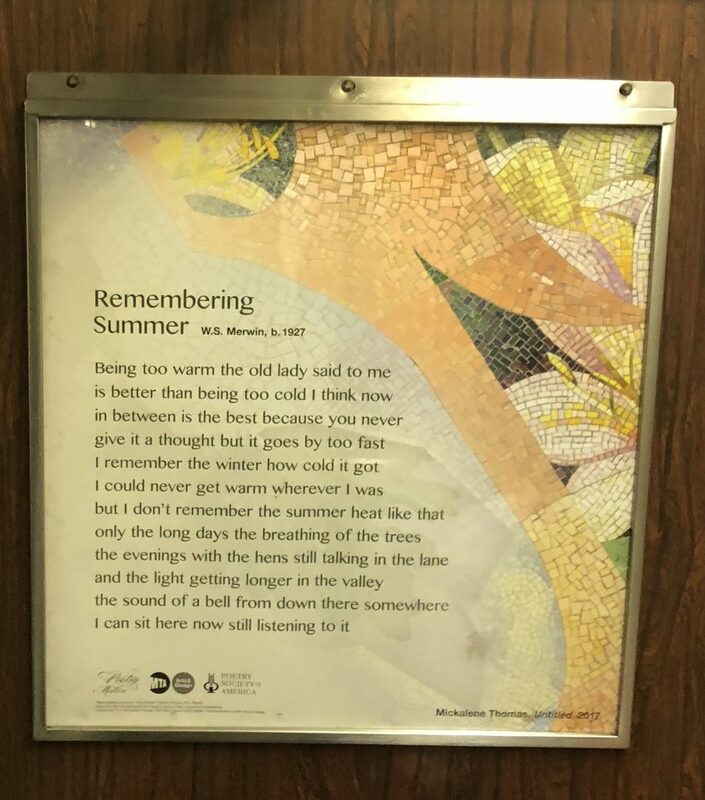 This entry was posted in Poems, prose & song and tagged poems on the subway, Poems on the underground, subway poetry on July 22, 2016 by Louise. 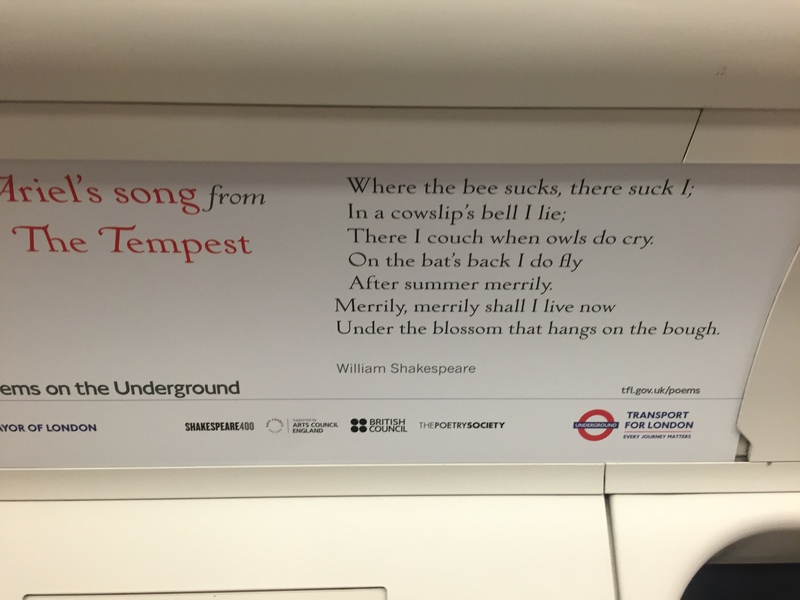 Seen on the NYC subway C train, Feb 25, 2015. 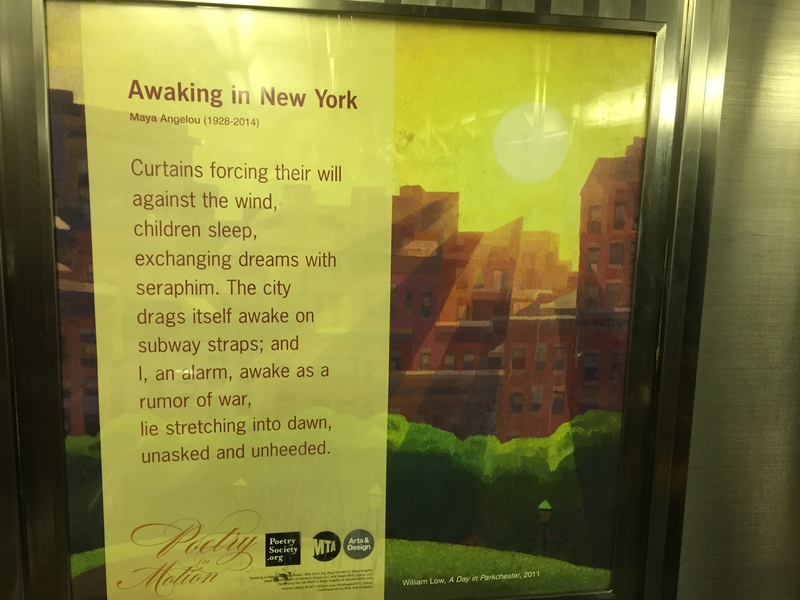 This entry was posted in Poems, prose & song and tagged Angelou poem, Awaking in New York, Maya Angelou, poems on the subway, poetry in motion on February 25, 2015 by Louise.